Dutch Courses Amsterdam: Dutch for Expats! The Dutch courses in Amsterdam at Katakura are designed to teach the language in a way that is easy to comprehended and put into practice. This is done through regular lessons and classes. In order to provide you with the necessities for your job, day-to-day usage, and have more leverage competing for important positions at work or university, we strive for effective Dutch courses in Amsterdam. That being said, from our experience teaching thousands of students the Dutch language, we have structured our lessons around a simple step-by-step approach. Learn at an effective rate with like-minded students. Small classes and multiple levels of language comprehension make for an effective learning experience. 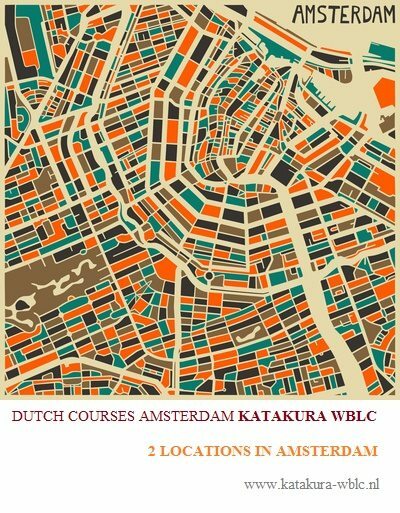 Dutch Courses Amsterdam Katakura WBLC has 2 locations in Amsterdam. One is located in the centre of Amsterdam near the Anne Frank House and the other is in the south part of Amsterdam near the World Trade Centre. Textbook: The Katakura WBLC Method For Beginners: Learn Dutch Fast For Expats( Beginners 1,2,3).You will get your textbook on your first lesson at the school. The price of the textbook is € 27,00. Textbook: The Katakura WBLC Method For Beginners: Learn Dutch Fast For Expats( Beginners 1,2,3).You will get your textbook on your first lesson at the school. Lesson fee: in total € 139,00 ( in total / textbook is NOT included ) Please note: this course may be for 4 , 5 or 6 persons. This is not optional, however the course will vary as appropriate: €139,00 (4p), €124,00 (5p), €115,00 (6p). Lesson fee: in total € 139,00 ( textbook is NOT included ) Please note: this course may be for 4, 5 or 6 persons. This is not optional, however the course will vary as appropriate: €139,00 (4p), €124,00 (5p), € 115,00 (6p). Lesson fee: in total € 139,00 ( in total / textbook is NOT included ) Please note: this course may be for 4, 5 or 6 persons. This is not optional, however the course will vary as appropriate: €139,00 (4p), €124,00 (5p), €115,00 (6p). 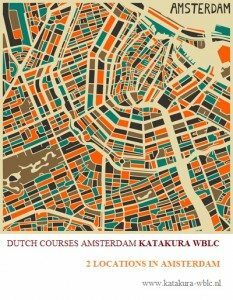 Textbook: The Katakura WBLC Method For Beginners: Learn Dutch Fast For Expats( Beginners 1,2,3) & extra material Code Nederlands.You will get your textbook on your first lesson at the school. The price of the textbook is € 27,00. Lesson fee: in total € 139,00 (Textbook is not included) Please note: this course may be for 4, 5 or 6 persons. This is not optional, however the course will vary as appropriate: €139,00 (4p), €124,00 (5p), €115,00 (6p). Katakura is the best value Dutch course provider in Amsterdam, the heart of The Netherlands. Here in the capital of the country we teach to expats and foreigners alike. Since you are right in the center of Dutch culture it’s easy to pursue a high level of competence in the Dutch language. Our Dutch classes are all about immersion while you learn. The more you can immerse yourself in a foreign language, the easier it is to learn and absorb all the subtleties which make you stand out from the rest and eventually let you blend in with the natives. For high quality Dutch courses in the lovely Amsterdam, apply to one of our available courses and dive right into Dutch. Why choose our quality lessons in Amsterdam? Our quality Dutch lessons in Amsterdam are suited for total beginners as well as people with some familiarity with the language. You can learn quickly with the group exercises and other students. The courses are divided into segments based on the level of the speaker, in accordance with the European Framework of Classification for Languages. We make sure you get the best teachers. All of the teachers are native experts in the field. Having a wide variety of effective teaching methods readily available, they’ll prepare you to take on the Dutch language as quickly and thoroughly as possible. Active practice is the best way to adopt a new language. We realise this by having students cooperate in speaking exercises and communication challenges with the whole group. Remember the classes are small, so there is plenty of room to individually tailor the Dutch lessons. Once you’ve completed a Dutch course successfully you can easily jump right to the next level thanks to the well-structured lesson system for Dutch courses. Our school is international, friendly and relaxed. We guarantee small classes (max 8 to 9 students), leading systematically from 1 level to the next. All our teachers are native-speakers, experienced, highly competent and are using communicative, dynamic methodology. Our teachers make learning fun and get amazing results. Lively conversation and discussion is the main aim, but there is also language input (vocabulary and grammar) and practice of other skills. We offer 12-, 8-, 4-, 2-1 week and weekend courses, (semi)intensive Dutch language courses with monthly start dates. 2 locations in Amsterdam (Amsterdam Centre & Amsterdam World Trade Centre). Get going right away with your lessons, choose of the Dutch courses available in Amsterdam and start learning the basics! We have a lot to choose from. Depending on your current experience with the language and your goals you have plenty of choice regarding the classes you want to attend. Ranging from beginner to upper intermediate, find the Dutch lesson suited for your location and availability to attend, for example in the evening or at the weekend. For students who need to learn with a deadline we have extra fast courses in Dutch.